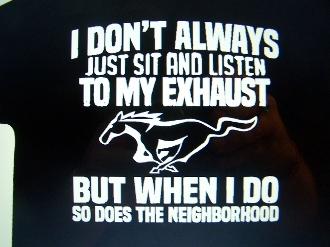 MUSTANG LISTEN TO MY EXHAUST T-SHIRT CHOOSE SIZE AND COLOR. THE LOGO COLOR IS FOR THE LOGO ON THE FRONT AND THE LETTERING ON THE BACK. THE SMALL LOGO IS ON THE FRONT AND THE LARGE LETTERING AND LOGO ARE ON THE BACK.